Prospects are interested in your products. They’ve already interacted with your company by signing up for your email newsletter, accessing a free ebook, or tweeting at you on social media. You’ve been building trust, and you think your prospects are finally ready to make a purchase. To ensure that prospects make that leap and become customers, you need to create content specifically for the bottom of the sales funnel. This content aims to reassure prospects that they’re making the right purchasing decision and decreases the amount of risk involved in spending their money. The following are four types of content you should produce and curate for customers at the bottom of your sales funnel. You can talk all you want about how great your company is, but consumers might not listen. Online reviews and testimonials from other customers are what will convince them to use a certain product or service. According to a recent survey conducted by BrightLocal, 92 percent of consumers have read reviews to find out the quality of a local business. BrightLocal also revealed that 68 percent of consumers trust a business more when they see positive online reviews about it. You should proudly display your customer reviews and testimonials on your various product pages. Here’s a great example from ModCloth, which shows customer reviews and ratings on every single one of their products. Allow customers to give you a star rating, as well as write their own thoughts about your products and company. These testimonials will speak for your company and demonstrate that you only sell quality products. A picture and a product description won’t suffice for many products. Customers want to see products in action and understand how they really work. Detailed product reviews and videos help customers envision themselves using your products and enjoying them. Some excellent product reviews reside on the bidetsPLUS product pages. All the products they sell have accompanying videos to show prospects what it’s like to use them. ModCloth does the same thing by making videos that show their clothing on models. These videos bring the products to life and demonstrate their usefulness to prospects. Most people are visual learners and can’t decide whether or not they’d like to purchase a product without first seeing a demonstrative video. If you’re selling a product that people are going to use on a daily basis, or one that is highly technological, a video is extremely crucial. Let’s say a prospect logged onto your website, put an item in his or her shopping cart, and then decided to abandon it for some reason. This may sound rare, but according to Shopify, 67.45 percent of shopping carts are abandoned before prospects have a chance to complete their sales. You need to track these carts, and then send emails to prospects offering deals on the items they abandoned. On the Shopify site, you can check out examples of effective abandoned carts emails. One email sent by Nomad.com reminds a prospect about cables he abandoned in his cart, and then offers him a code for 15 percent off his purchase. Prospects may hesitate before spending money on your product. However, if you’re there to remind them about it and sweeten the deal via email, they’re going to be more likely to reevaluate their decision. You need to include a frequently asked questions page on your website that shows your return and exchange policy, customer service contacts, and hours of operation. This will reassure customers that if there’s anything wrong with the product, they can get their money back or exchange it with ease. For some inspiration, check out the FAQ page from Zappos.com. It’s comprehensive and goes over everything prospects need to know about payments, returns, how the company works, how to write reviews, and what to do if there are any issues. You’ve come so far. Now it’s time to close the deal. 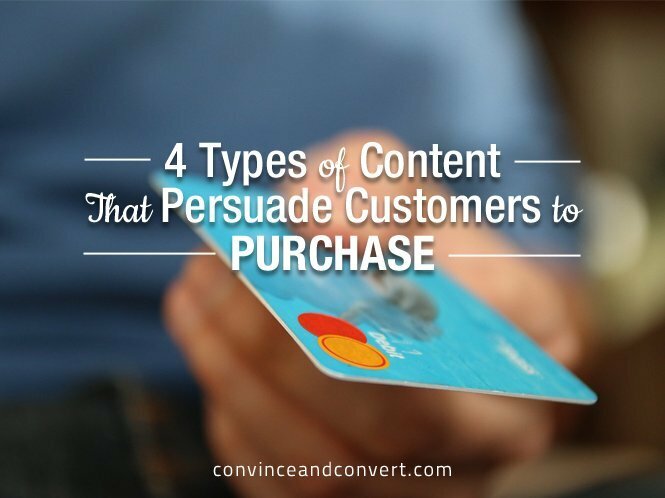 By creating these four types of content, you can rest assured that prospects are going to be more willing to make a purchase and become loyal customers.